IRVINE, Calif. and SILICON VALLEY, Calif., April 9, 2019 /PRNewswire/ -- Ten-X Commercial, the nation's leading transaction platform powering 90% of online commercial real estate sales, today released its Winter CRE Volume & Pricing Trends report. The analysis found that CRE transaction deal volume totaled an impressive $537 billion at the conclusion of 2018, the second-largest year on record for CRE sales in the U.S. This impressive close positioned the CRE market for a strong 2019 start, a momentum the market has been able to maintain through the end of Q1 2019. The final quarter of 2018 saw 7.5% year-over-year transaction volume growth across all sectors of the CRE market – retail, industrial, multifamily, office and hotel. Opportunity Zones were a source of transaction growth as CRE investors began to take advantage of the tax advantages of Opportunity Zone investments in the new tax law. According to Real Capital Analytics, 14% of all 2018 sale activity occurred in designated Opportunity Zones, a practice that continued into Q1 2019 and is likely to continue. M&A activity was also a major theme in 2018, particularly in the retail and hospitality sectors. The $5 billion merger of LaSalle Hotel Properties and Pebblebrook Hotel Trust boosted hotel deal volume to over $14 billion, more than double its level one year ago. On the retail front, despite 2018's steady stream of retail bankruptcies and store closures (such as Toys"R"Us and Brookstone), major mall mergers and acquisitions boosted deal activity. While M&A activities affected retail deal volume in Q3, deal volume for the sector reverted back to its historical levels of about $18.6 billion as the year closed. "The current economic expansion in the U.S., now the second longest in recent history, eased investor concerns and fueled CRE growth throughout 2018. However, this is not translating into further CRE pricing growth," said Ten-X Chief Economist Peter Muoio. "The pricing climate remained stagnant in the early months of 2019, as it was throughout all of last year." 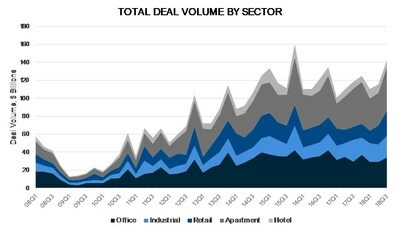 The strong level of deal volume was intertwined with weak CRE pricing growth. In the first quarter of 2019, most segments are posting slow year-over-year price gains. As Ten-X's Muoio noted, "The persistence of flat pricing has diminished the disconnect between buyers and sellers on pricing expectations, enabling stronger transaction volume. The general realization of late-cycle CRE fundamentals is ironically boosting deal flow." Office pricing is the clear exception with 5% year-over-year growth. However, the other CRE sectors are either slowing down or stagnating. Hotel pricing is relatively still, with current pricing at its lowest level since February of 2018. The industrial sector is continuing to weaken, as year-over-year pricing decreased by 2%, and has been negative on an annual basis for 17 consecutive months. With quarterly industrial data now showing vacancies beginning to rise and rent growth to slow, the Ten-X Nowcast's weakness over the past year or so shows investors sensitive to shifting fundamentals. Ten-X's latest nowcast showed multifamily as having the weakest pricing growth. Most recently, pricing declined 0.4% in February, which brought annual growth down to 1.3%. The nowcast also showed that pricing in the retail sector continued to slow, with annual growth remaining just 1.3% – its lowest level in this cycle. 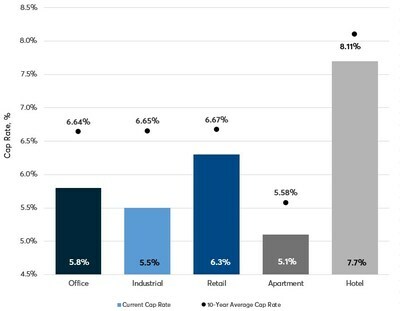 As interest rates rose during Q4 of 2018, cap rates across all CRE sectors fell, with the exception of industrial cap rates which remained the same. 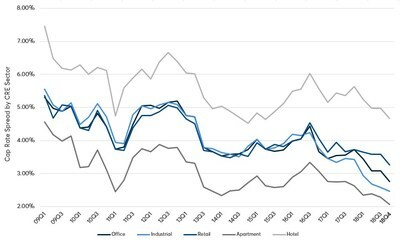 Hotel, retail, office and apartment cap rates are down 20 bps from Q3 of 2018, with the office sector revisiting its historical low of 5.8%, and the apartment sector down 10 bps from the third quarter of 2018. "Cap rate spread compression offset rising interest rates in the latter months of 2018, and the beginning of the retreat in interest rates in December further removed upward pressure on cap rates," said Muoio. "At this point increasing cap rates is less of a concern then it had been, with treasuries falling." The compression in cap rate spreads continues to pull them further below their historical average. Hotel spreads declined from the third quarter of 2018, bringing them down more than 90 bps from their 10-year average – their biggest deviation on record. Industrial cap rates have seen the greatest separation from their 10-year average in 2018, widening throughout the year to 167 bps most recently. Office, retail and apartment spreads are also below their respective long-run averages. "Cap rate increases have diminished as a market concern, as Treasuries ease. Market concerns about a potential downturn have arisen as the yield curve has inverted. Growth concerns and their potential impact on NOI are now front and center for CRE investors," said Muoio. While retail fundamentals remain weak, retail deal volume climbed to an impressive $84.5 billion in 2018, its highest since 2015. This major discrepancy can be largely attributed to the hefty M&A the sector experienced, as investors began to redevelop property. According to RCA, deals involving entity-level transactions or portfolios grew 131% year-over-year. One of the largest acquisitions was Brookfield's reported $14.8 billion acquisition of GGP, transforming Brookfield into the second-largest mall owner in the U.S. While the latest pricing data shows a slowdown, pricing in the retail sector throughout 2018 – specifically in malls – saw extraordinary growth, ranging from 32% to 141%. The sector overall also experienced pricing growth, ranging from 1% to 10% throughout the year. "Retail deal volume has been boosted by M&A, in addition to buyers looking to re-position retail assets as bricks and mortar retail continues its transformation," said Muoio. Ten-X Commercial is the leading end-to-end transaction platform for commercial real estate that powers more than 90% of online CRE sales. Our platform empowers brokers, sellers and buyers with data-driven technology and comprehensive marketing tools to expand market visibility and decrease time to close. Ten-X Commercial is headquartered in Irvine and Silicon Valley, Calif., with offices in key markets nationwide. Investors in the company include Thomas H. Lee Partners, L.P., CapitalG (formerly Google Capital) and Stone Point Capital.